Happy Valentine’s Day from Gennett Records! 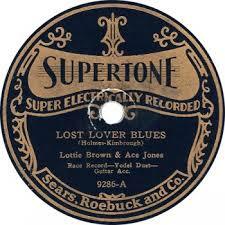 Another take on Valentine’s Day from Gennett Records – Lottie Kimbrough’s “Lost Lover Blues.” She recorded it with Winston Holmes and Miles Pruitt on 8/21/1928 in Richmond. It appeared on Gennett 6607, Champion 15591, Superior 2717, and Supertone 9286. Many people shared her sentiment, as the Champion issue sold over 5,500 copies between 1928 and 1931. Video | This entry was posted in Champion, February, Gennett, Video and tagged Champion 15591, February, Gennett, Gennett 6607, Gennett Discography, Gennett Records, Lottie Kimbrough, Miles Pruitt, Valentine's Day, Winston Holmes. Bookmark the permalink.